Together, we can inspire children and give them the tools to succeed in school. Back to school rituals are how we let our children know that education is important. This time is supposed to be a wonderful time for children, filling them with anticipation, confidence and motivation. It's how we let them know that we believe in them and their ability to succeed in school. Unfortunately, many children do not have this back-to-school experience. We live and work in a community where many children show up to school empty-handed on their first day. Our educational partners have told us that when kids arrive without the needed supplies, they are not ready to learn. Every summer United Way of Androscoggin County, with your help, hosts the Backpack Project. This program - one of the largest of its kind in Androscoggin County - provides backpacks and school supplies for the upcoming school year to children in need. 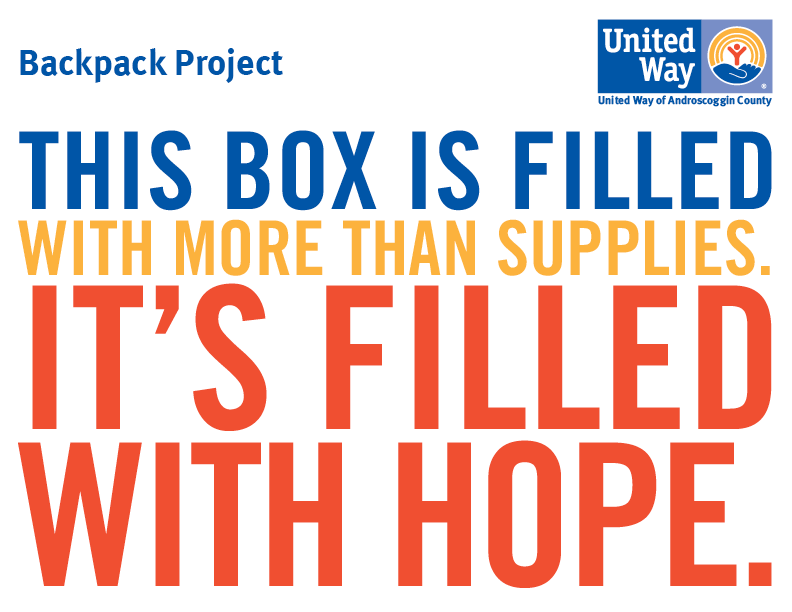 The Backpack Project is one of many ways that United Way works to increase the academic success and high school graduation rates of children in Androscoggin County. We invite you to join in our efforts to help prepare our youth to be ready to learn. Your contribution to this initiative will make a powerful statement in support of education for all the children in our community. Below you'll find simple and easy ways you can join us in supporting the Backpack Project. Start a movement in your workplace by designating a collection spot. Click here for a poster to help! Starting mid-summer pruchase and deliver supplies to a collection site. Stay tuned for an updated list of collection sites.